This Sunday I co-facilitated a Blessing Way at the Foundation of Light in Ithaca, NY. Blessing ways thankfully are coming out of the wood works, finding their way into civilization again as more women are recognizing how wholesome it is to reestablish connection with our natural origins. This is especially beneficial when you are a woman who is on the path of becoming a mother. A woman who intends to do what it takes to provide gentle and safe passage for her child and herself. Blessing ways originate from indigenous tribes (here in the US particularly from Paganism and Native American traditions). A blessing way is usually done by women for women, and can be as simple or elaborate as the women choose it to be. The one I was fortunate to be a part of this weekend, was simple, yet profound, and well attended by a group that included girls and women of a variety of ages: the mother to be, her mother and grandmother – soon to be grand- and great grandmother, siblings, friends, cousins. After sharing a delicious meal together we gathered around in a circle to do a web weave. A web weave is about weaving a connection between women, to honor and support a pregnant woman on all levels, through the last days of her journey into motherhood, from the miracle of conception and growing a baby in her womb, to the miracle of giving birth and nursing her baby. The red yarn gets thrown around and wrapped around the left wrist of every woman. The left symbolizes the feminine, nurturing aspect and is closest to the heart. Red is a sacred color of protection, and also represents the life force. When everyone is connected, a blessing is shared to seal the connection. 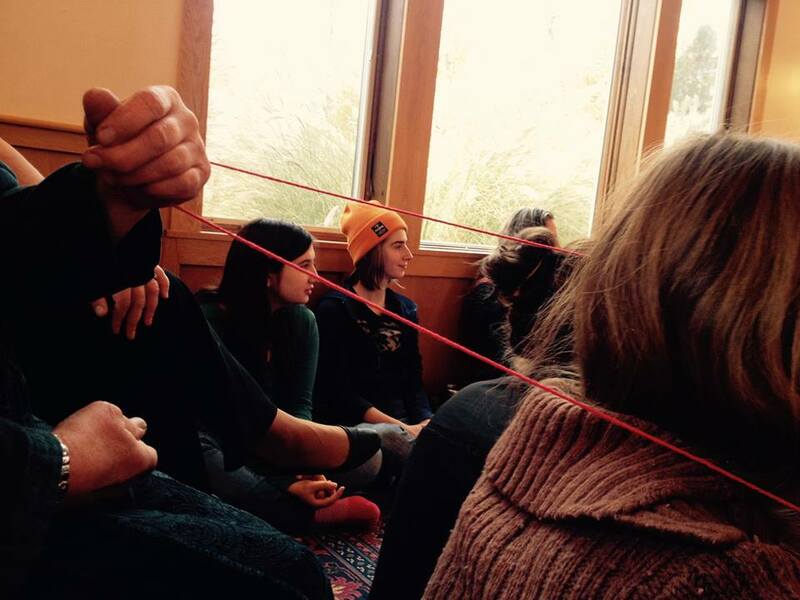 Nicolette, a lovely new friend I met recently, facilitated the web weave in a beautiful, simple and grounded way. She learned about this tradition from one of her teachers in Ecuador. The blessing I was guided to provide was the Heart Sutra Mantra – Gaté Gaté. A chant in the ancient, sacred Sanskrit language, that is known to transcend fear, worry and all that gets in the way of experiencing the joy of being, from the cosmic heart of creation. Just realizing now that with this chant traditions from East & West were brought together. All sorts of emotions were experienced and released in the room. Some were moved to tears and others giggled. As an empath I experienced all of the emotions that surfaced in this group, without judgment, tears streaming gently as I chanted, smiling through it too as I witnessed and felt the much needed giggles from the girl right next to me, until guided to stop and sit in silence as the release came to completion. An expansive, heart felt vibration of pure Love filled the room and everyone in it. When finally guided to speak again to complete the blessing, I opened my mouth to share words I channeled from the collective consciousness for the group. The words did find their way into the hearts of all who resonated with them. Then the bracelets were cut and tied. They will be worn until the news of the birth of the baby has reached the women who are wearing them. Some women may choose to still wear the bracelet until it wears out and breaks. When the bracelet is broken or cut, it can be tied to a tree branch or thrown outside in the yard or natural setting, offered as a gift to Mother Earth. Birds may find it to build their nest. Words of loving support, appreciation, and many hugs were shared in this beautiful group of women. I enjoyed meeting and hugging quite a few of these women, and witnessing all that was shared. Speaking of sharing, desert was served next, which included home made chocolate cupcakes, and then the event morphed into more familiar territory as is customary in the US: a baby shower. Mother and child were certainly showered with an abundance of material gifts for baby. There are various shamanic and indigenous tribal traditions in North and South America where web weaves are practiced since ancient times, as part of a blessing way. Personally I too have come across this practice here in the US, where I have attended, facilitated and been fortunate to receive blessing ways. In some traditions the bracelet is burnt after it comes off. It symbolizes transformation, as both mother and child experience transition and transformation during birth. The burning of the yarn takes place over a bowl of water. Afterwards water and ashes are scattered outside, over the earth. In this way the elements earth – water – fire – air, essential parts that are involved in the creation and birth of an earthly life, are recognized and honored. Sometimes the yarn doesn’t always completely burn (when there are synthetic components). When this happens, the burnt part looks much like an umbilical cord (the part of the cord that eventually falls off the belly button, shrivels up and darkens). It also is a beautiful reminder that even after the umbilical cord is cut, the original bond between mother and child remains. More essential information about cord cutting, and the benefits of delayed cord clamping and cutting can be found here. 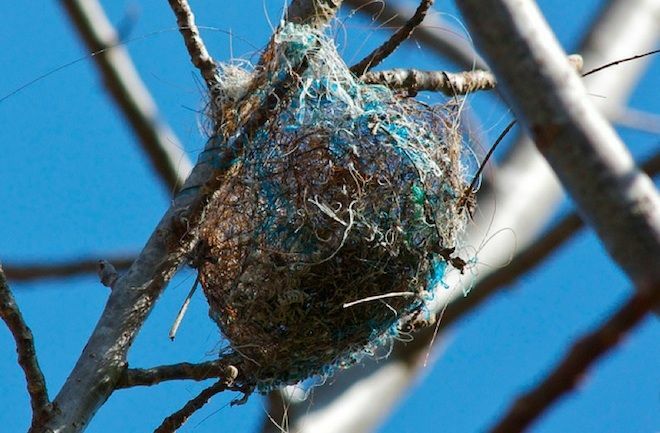 Left over yarn that didn’t completely burn can still be discarded outside and would make an excellent addition for a bird’s nest.